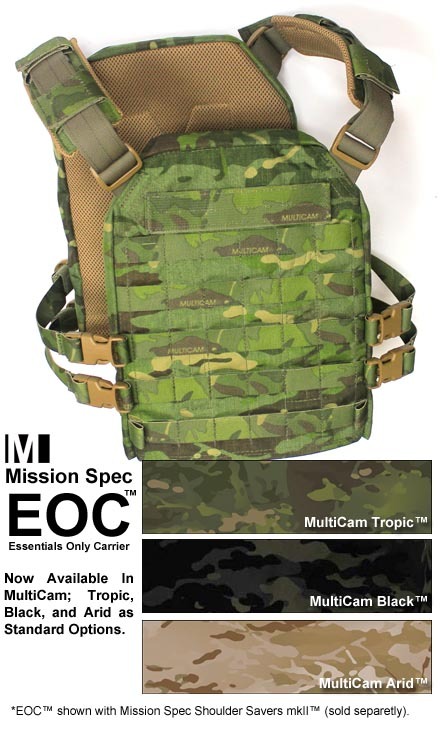 Mission Spec’s Essentials Only Carrier is now available in MultiCam Tropic, Black, and Arid patterns. These options are also available for the Shoulder Savers mkII and the Gibborim Gun Belt. As these MultiCam patterns are only available in 500D Cordura nylon, the listed products are not available in the Mission Spec standard 1000D fabric. Mission Spec has released a video promoting their Essentials Only Carrier. The EOC fits two medium or large sized shooters cut SAPI armor plates. The 1000 Denier CORDURA constructed carrier utilizes ITW Nexus acetal polymer buckles. All polymer components are nIR treated and/or compliant (excluding Black). All design, testing, and manufacturing is performed in the United States with US sourced components. The EOCs rear plate bag can be independently raised to offer better rear armor protection to a wider range of users. Low profile design allows the EOC to be concealed under a light jacket for covert uses. The EOC is a plate carrier available in the following patterns: Kryptek, MultiCam, Coyote Brown, Ranger Green, Instructor Red, Black, and M81 Woodland. The EOC is US sourced and produced. Mission Spec is announcing the addition of Kryptek™ Highlander, Kryptek™ Typhon, and Instructor Red to the available patterns for the Essentials Only Carrier (EOC) and optional (sold separately) Shoulder Savers mkII. These additional options include (excluding Instructor Red) pattern matching and licensed Kryptek™ 55301 spec PALS webbing to maintain the patterns consistency. The EOC fits two (one front, one rear) medium or large sized shooters cut (e,x)SAPI armor plates. The 1000 Denier CORDURA® constructed carrier utilizes ITW Nexus acetal polymer buckles. All polymer components are nIR treated and/or compliant (excluding black). All design, testing, and manufacturing is performed in the United States with US sourced components. The EOCs rear plate bag can be independently raised to offer better rear armor protection to a wider range of users. Low profile design allows the EOC to be concealed under a light jacket for covert uses. 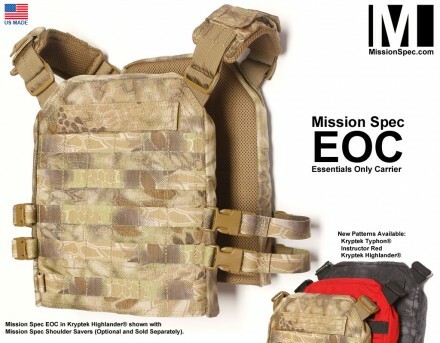 The EOC is fully compatible with DKX Max III Polyethylene armor (shooters cut) available at MissionSpec.com. Mission Spec Shoulder Savers mkII (sold separately) are also immediately available in the new color and patterns. Both the EOC and Shoulder Savers mkII are covered under the Mission Spec Limited Lifetime Warranty. In addition to the new patterns, Ranger Green will be available in approximately 1 week.